Enjoy this fall themed Thanksgiving gift basket! Wherever people gather this holiday season, they'll enjoy the occasion even more over a generous selection of Mediterranean gourmet olive oil & olives. That's the thinking behind this varied olive oil and olive assortment. 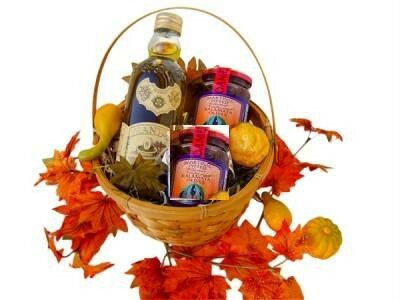 The olive oil assortment is packed in a handsome reusable wicker basket with handle and is decorated with a festive bow, fall leaves and gourds. (9" diameter x (approx. )7" high, 4.4Lb basket. Shipping box 11"x8 1/2"x5 1/2". Note: Basket design/color and ribbon color may vary; picture posted is an example of how the basket will look with the goods. For Thanksgiving delivery, please order by November 22th Stay tuned for our Christmas and Hanukkah Baskets!